SterJo Password Unmask could reveal/unmask most of password text boxes containing hidden characters known as asterisk (\'*****\') immediately. Many applications like CuteFTP, Microsoft Outlook, other e-mail clients or login forms would save and hide their passwords with hidden chars to prevent others from seeing them. Sometimes using different passwords for each account could be forgotten and there is no way to reveal them. 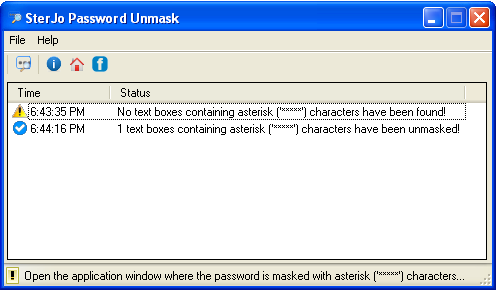 Run and application and open the window where the password is hidden with asterisk (\'*****\') characters. Click "unmask" button and you will see how the asterisks are converted into letters instantly. Copy your previously masked password and don\'t ever worry if you forgot outlook password, CuteFTP or any other password again.